Power To Perform - MMA Combinations That Pack The Most Punch. Having a good supply of moves and combinations should the opportunity arise, is an area where one can gain the advantage. Get detailed descriptions right here on how to perform kick/punch combinations! Dominating in MMA competition is all about maximizing opportunities. Having a good arsenal of moves and plenty of skill will help the fighter position themself on the leaderboard, and enable them to score that big knockout, should all go to plan. Being under-prepared, on the other hand, will only serve to give your opponent the advantage, the last thing any fighter wants or needs. One way to prepare well for any match-up is to develop a good command of the various combinations needed to counter, or attack your opponent. Having an understanding of when and how to execute several attacking options in rapid succession will provide the fighter with an ability to shake their opponent to grab a strategic advantage, that all important upper hand, which sends out the message that they are in total control of the situation. Usually a fighter at the top of their game will know when to put together various moves. Such an athlete will have the qualities needed before they can apply these combinations. Timing, an ability to read the fight and know your opponent, and good reflexes are desirable qualities needed before successful combinations can be applied. We all know the standard right/cross combination and how effective it can be in setting up a number of kicks or further punches. By adding a powerful round kick to this one/two combo, a fighter can catch their opponent when they are at their weakest to score a down. Combinations, however, need not only be used as a way to score a knockout. They can be used to wear an opponent down, as in the case of multiple low kicks delivered in succession. A round kick off the front leg followed by the same kick of the back leg will have the double impact of taking power away from both your opponent&apos;s legs, for example, while the double round kick off the back leg will eventually take away all power from an opponents countering kicks if done frequently enough throughout the fight. The key really is to know when in the fight to apply various combinations. If your opponent is a strong kicker it might be wise to emphasise your kicking combinations to take away their legs. If your opponent is a strong puncher, multiple kicks, and punches to the shoulder/arm region will eventually cause their punches to lack the desired impact and, in some cases, take away their ability to keep their hands up, thus opening them up for combinations to the head. 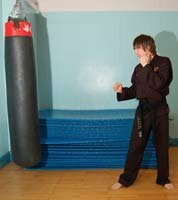 Although a good command of all basic punches and kicks are needed to win, having a good supply of moves to be used in combination should the opportunity arise, is an area where one can gain the advantage. With the following kick/punch combinations you will vastly improve your stand up game. One of the more basic combinations is the jab/cross/round kick succession. The idea with this series is to throw the jab as fast as possible to rock your opponent before launching a round kick from the back leg. 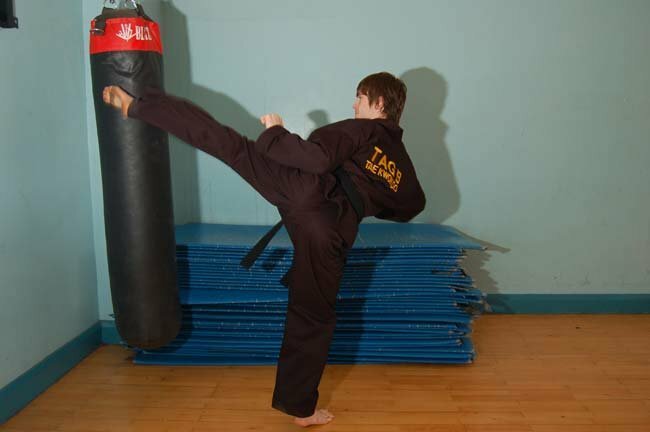 Typically this kick will connect with your opponent&apos;s front left outer thigh, but it can be targeted at the waist. Kicking to the head in this fashion could be considered rather risky, but this is to a large extent dependant on a fighter&apos;s skill level. Upon throwing the right (the second punch in the combo), draw back your hand all the way to blocking position before executing the round kick as this will ensure you do not leave yourself open for a counter attack should your opponent survive your first two punches. With the kick, pivot on the front foot and twist your waist and hips into the movement for maximal power. Bring back leg quickly. This combination can be used often to set up further attacks or keep the momentum going, but the best time would be when your opponent is tired and their hands are dropping. Catch them off guard and then score a down with the round kick. 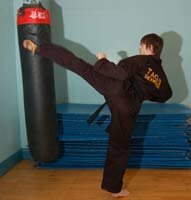 Execute the round kick as described above, before simultaneously bringing the jabbing had up as the leg is grounded, to drive the punch into your opponent&apos;s jaw. A straight cross can be used as a finisher in this 3-strike combo. The round kick should weaken your opponent sufficiently to cause them to drop down into the uppercut. This combination can be effective when countering your opponent&apos;s straight cross. Be sure to move to the side when delivering the initial round kick though to avoid the incoming right. As your opponent is trying to stabilise themselves from the round kick follow up with the uppercut/cross. They will be most susceptible to it at this time. Catching your opponent off guard is an important way to score valuable points. Using the cross/hook/front kick combo, as one of the less common groupings, allows a fighter to cause some major damage while disorienting their opponent. Lead with the right hand, straight from guard position before swinging the hook around, using the waist and hips to generate force. Finish with a standard pushing front kick to the midsection to drop your opponent. Again, a perfect combination to use when your opponent is tired as the will be least receptive to countering this series of movements. Also, when jabs are being thrown your way, move to the outside of the jab and sneak your cross hand in as your opponent&apos;s hand is extended. As this connects, swing around with the hook before executing the front kick. An ideal way to progressively weaken your opponent&apos;s legs, this combination targets the outside thigh on each leg for maximum damage. More of a wearing down combination, this move requires good core stability (waist, hip and lower back strength) and mastery of both back and front round kicks. Kicking with the front leg first will cause your opponent to instinctively block this kick (if it is fast enough they will not succeed), whereupon you bring through the rear leg for maximum impact. Be sure to either follow up with further hand/feet combinations, or move out of the way before selecting your next opening. Not to be used too often as it can be physically demanding, this combination can be most effective when your opponent is moving forward on the offensive. Be sure to execute, then move; it can leave you open, particularly if used later in the fight. 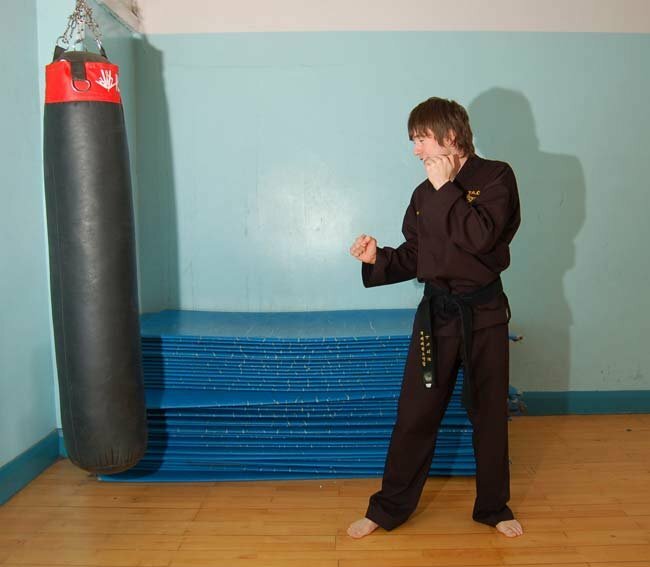 Also ensure the front roundhouse is delivered with maximal impact, not merely as a set up for the back kick. You do, after all, want to throw your opponent off guard from the outset. Being a well-rounded fighter requires a number of desirable attributes: speed, power, flexibility, strength, and conditioning being fundamental requirements. You can now add to this mix, kick/punch combinations that will knock your opponent into next week. Use the combos featured in this article wisely and you will have improved your fighting game immeasurably.